Here’s an intriguing new children’s picture book. 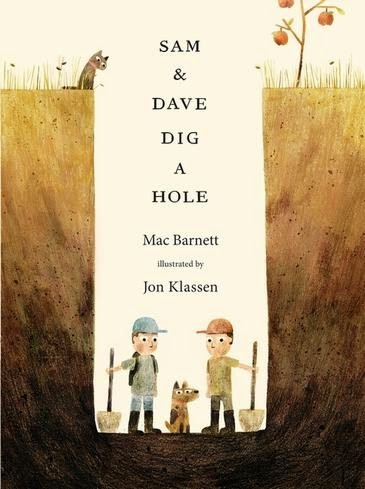 Sam and Dave Dig a Hole was written by Mac Barnett, illustrated by Jon Klassen, and published in Australia by Walker Books, 2014. It was published in USA by Candlewick. Sam and Dave are on a mission. A mission to find something spectacular. So they dig a hole. And they keep digging. And they find ... nothing. Yet the day turns out to be pretty spectacular after all. Attentive readers will be rewarded with a rare treasure in this witty story of looking for the extraordinary - and finding it in a manner you'd never expect. I know kids will love this as a story to watch and listen to. I can see their eyes getting bigger as they realise the boys are so close to real treasure, and hear their chuckles as they wonder aloud if the dog engineered the whole dig as a way to retrieve its bone. Perhaps Sam and Dave will inspire them to start their own digging adventure. Wise parents will harness all that energy and direct their kids to the vegetable patch! Older kids too will enjoy discussing Sam and Dave’s adventure. What is the significance of the apple tree becoming a pear tree? Is the dug hole actually the gateway to a worm hole? Can we use string theory and parallel universes to explain what happened? I’ve previously reviewed Klassen’s This is Not my Hat. I do love his illustration style. In this book he’s used lovely earthy tones that perfectly match hole-digging. His illustrations are such an integral part of the story, providing lots of humour for young readers. There’s a fun trailer for Sam and Dave Dig a Hole you can show your kids to whet their reading appetites! And a great TED talk by Mac Barnett that reveals why he believes a good book is like a secret door. Other reviews of this book: Jen Robinson’s Book Page, Good Reads With Ronna, 100 Scope Notes. Here's one young reader’s reaction to the book!